Thoughts on the world of sports, popular culture, and anything else itching my brain. For our ninth annual BBQPalooza we decided the time was right to return to our home city and navigate some of the growing bbq scene in "The New Capital of Texas BBQ" (sorry Austin) ....the greatest city in Texas....and thereby the World.....Houston! In light of the recent move by Truth inside the city limits, the continuing excellence of Tejas, and a plethora of new and exciting spots we decided, why travel AWAY from the hottest BBQ spot in the country. The ninth edition of BBQPalooza contained some firsts for the group and as always the best food around. To kick off BBQPalooza9, we decided that we needed an attention getter. One of the coolest things happening on the Houston BBQ scene has been the rise of Pastrami Thursday. The two joints most associated with Pastrami Thursday and the smoked Reuben sandwiches are Tejas Chocolate & Barbecue and Roegels Barbecue. If we were going to ensure ourselves of a coveted Reuben sandwich at each joint we were going to have to divide and conquer.....and if we were going to divide and conquer, might as well split up into 3 groups and include the oft selling out and Houston favorite Corkscrew BBQ. So a plan was hatched. We would divide up the first leg into three groups and secure a spread at each location, then kick off BBQPalooza9 with the ultimate family feast....but where to meet? Where else should you kick off a Houston BBQ feast than at 8th Wonder Brewery? Chowing down on Hou smoked meats while sitting in Astrodome seats? Yes please. So as soon as we all arrived at 8th Wonder the spread was unveiled: a record breaking meal upwards of 9lbs! Six Reubens, brisket, sausage, pastrami, turkey, a few sides..... it was a FEAST. Several of the group immediately latched on to the Roegels' Reuben which delivers the ultimate flavor explosion. Russell has perfected the art of just the right amount of tangy, acidity to pair with what we all thought was the best smoked pastrami. His Reuben has bark and.....bite. But before you crown him, let me assure you that several other members swore by the smoother yet just as tasty Tejas sandwich. From the toasted rye down to the house made sauerkraut and Russian dressing this sandwich is a slightly smoother and silky Reuben. Everything in the Tejas Reuben perfectly compliments each other. If you ask me to pick? That feels like trying to choose between my son and my daughter. I take the easy out and say that both are the best sandwiches I have eaten and declare this Pastrami-off a draw.....the winner.....ME and the rest of the crew that got to eat both. Other than the Reubens, the star of the show was Tejas' chile relleno sausage which almost caused our BBQ fellowship to fracture one meal in, when the last bite was up for grabs. I can tell you that nothing was left from that Tejas spread....there is a reason they were in the last TX Monthly top 10. Corkscrew was not quite on par with our previous visits. Not sure if the ride in the car affected the meat more, but we have had some amazing spreads at Corkscrew and will have to get back soon to eat on site. Epic start to BBQPalooza9! After 8th Wonder, we took a short trip over to relative newcomer Feges BBQ. We have heard great things about this joint located inside 3 Greenway Plaza's food court (don't let this discourage you as we found parking easy in the garage where Feges will validate for you). 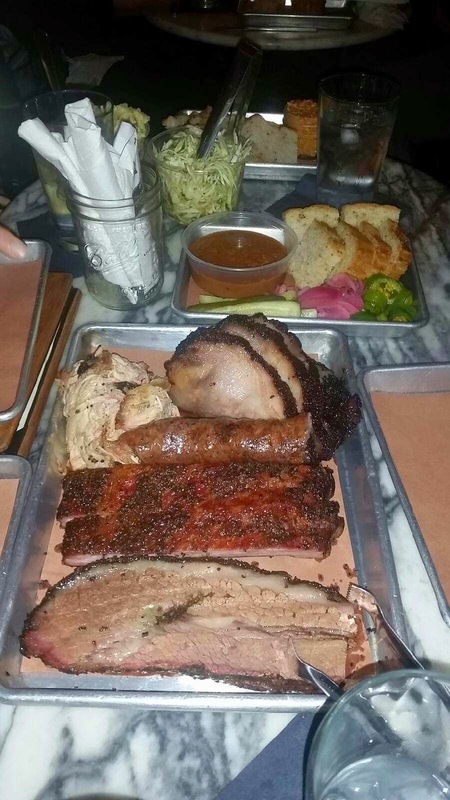 If you go, go early as we missed out on brisket and were relegated to whole hog, pulled pork, and smoked meat loaf. The pulled pork was top tier though, and whole hog and meatloaf were a unique and tasty treat. The real star here are the sides....we were lucky enough to get to try nearly everything from spiced cracklins to elote corn salad. The sides were amazing. My favorite was the Moroccan spiced carrots ---I don't even like carrots! 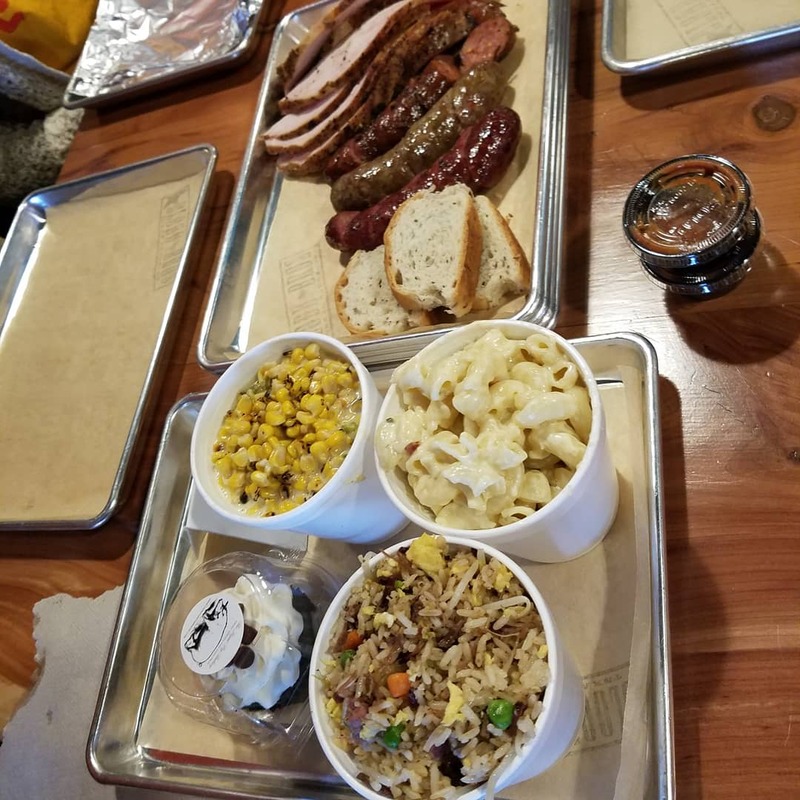 We will definitely be returning to Feges to indulge in those sides and hopefully have some of the brisket we have heard about. We wrapped the meal up with some PB&J chocolate cake. Excellent. Finally, we decided to head over to the best patio in Houston at Pinkerton's Barbecue. Luckily, we caught Grant right before he headed out on a previous engagement and got to visit for a bit. When you go to Pinkerton's you are literally visiting Grant at his house, and there is no better host. BBQPalooza mastermind and current BBQ missionary to Nashville, Chris Hicks, was able to place one of his The Oak TX BBQ stickers on the door at Pinkerton's which was awesome.....then we went out on the patio for college basketball, drinks, and settling food. We ended up spending about 5 hours at Pinkerton's enjoying the absolutely perfect Houston spring break weather. Once the appetites returned as always Pinkerton's did not disappoint. Firmly in my Hou top 5 with moist brisket, great sausage, world famous candy painted ribs, and the best side in barbecue....duck jambalaya! Although I am not a huge sauce guy, another big reason Pinkerton's is a personal favorite is that his sauce is my favorite. Perfect for dipping complimentary bread into between meats, I love it! A few other friends showed up late, and we actually made a second order before finally bringing day 1 of BBQPalooza9 to a close. In the words of Borat....SUCCESS! Day 2 of BBQPalooza began as several days lately have.....waking up early to be first in line at Truth BBQ! 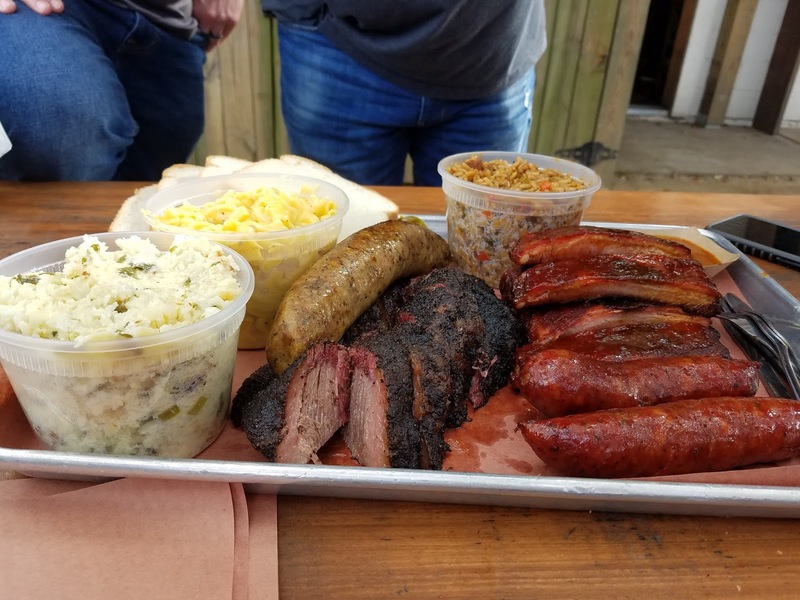 In fact we were actually the first patrons waiting at the door not so long ago when Truth first opened their Houston location (we kinda have an unhealthy love for Leonard and his smoked meats). BBQPalooza OG Jason Denham is said to often be waiting at the door as the workers show up! This visit was especially cool because one of our own, former student/athlete Cole Parkman is working at Truth and got to help make our tray. Super proud to see a former student who got to tag along on some of BBQPalooza this year living the BBQ dream! Another first is that the wives were finally allowed to break through the smoke ceiling and tag along for day 2 to "see what all the fuss" was about. Truth has the cities best brisket IMO, and their ribs somehow continue to get better every time. Combine those with the excellent sausage, ridiculous sides (tater tot casserole #1), and the homemade cakes and you can see why we feel Leonard could soon find himself in the top 5 and a legit #1 overall contender in the next TX Monthly list. The other thing about Truth is that more than any other pit master Leonard recognizes the art of making the perfect tray. 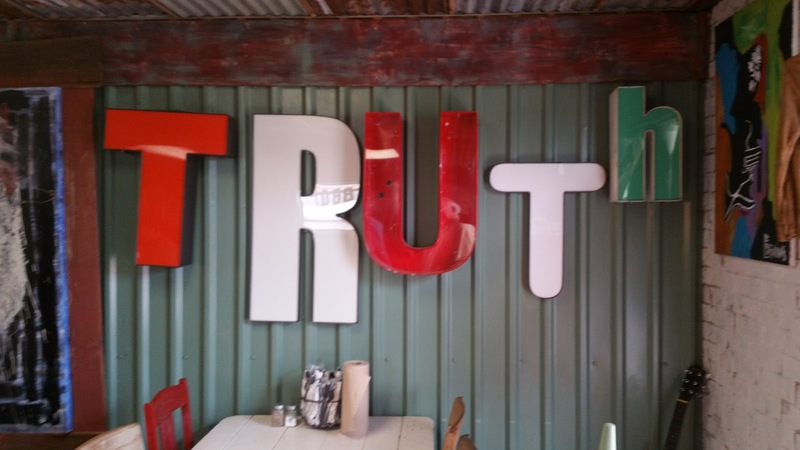 Every meal at Truth is meticulously crafted as an artist would paint a canvas! I could sit at the line for hours and marvel at the trays he puts together.....the ultimate Instagram spot. So once the ladies got their fill of cake and pics we left Leonard and Cole and crew to a packed house and wrapping up yet another sold out day in Houston. After Truth we thought the ladies might enjoy some "off the grid" BBQ so we headed over to Blood Bros. BBQ. Holy Brisket Fried Rice Batman! This was the revelation of the trip for me personally. I had heard how great the brisket fried rice was, but none of the superlatives actually did this perfect mash up justice! I never thought anything would give tacos a run for "best use of Texas brisket" title, but I could eat that fried rice every night. One of the "Bros" Terry, and pit master Quy were there and could not have been nicer. Terry talked to us for a long time about our adventure, and Quy was cool enough to give us a behind the scenes tour. 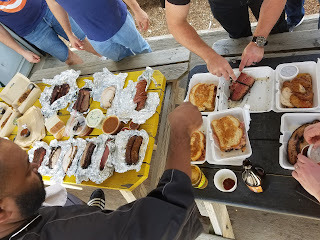 We had brisket, ribs, reuben sausage (the ONLY sausage of the weekend to compete with the Tejas chile relleno), Big Al's gumbo, Thai Green Curry boudin, brisket fried rice, a turkey banh mi, and Quy threw an extra slice of wagyu on our order. FANTASTIC! These guys are doing things I have never tasted before and it ALL works. I loved the meal and this spot further solidified my hypothesis that some of the coolest and most creative people in the world are currently doing Texas BBQ. Thank you so much Terry and Quy.....can't believe it took me this long to come by but rest assured I WILL BE BACK! Much like Day 1 it was now time to chill out for a while, and what better place to do that than The Pit Room? 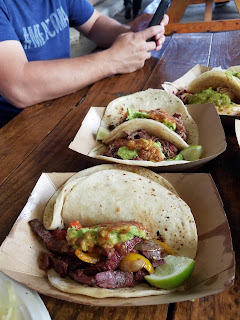 With an entire corner of Houston including outdoor seating, tacos, The Patio, craw fish, cold drinks....we once again spent several hours at our last stop of the day. After a few hours of the first ladies of BBQ hijacking the digital jukebox, some cold drinks, and some well timed craw fish it was once again time for Q. The Pit Room has the best tacos in Houston. If you have not been here you are ineligible to have a taco opinion or develop any kind of Houston taco ranking. 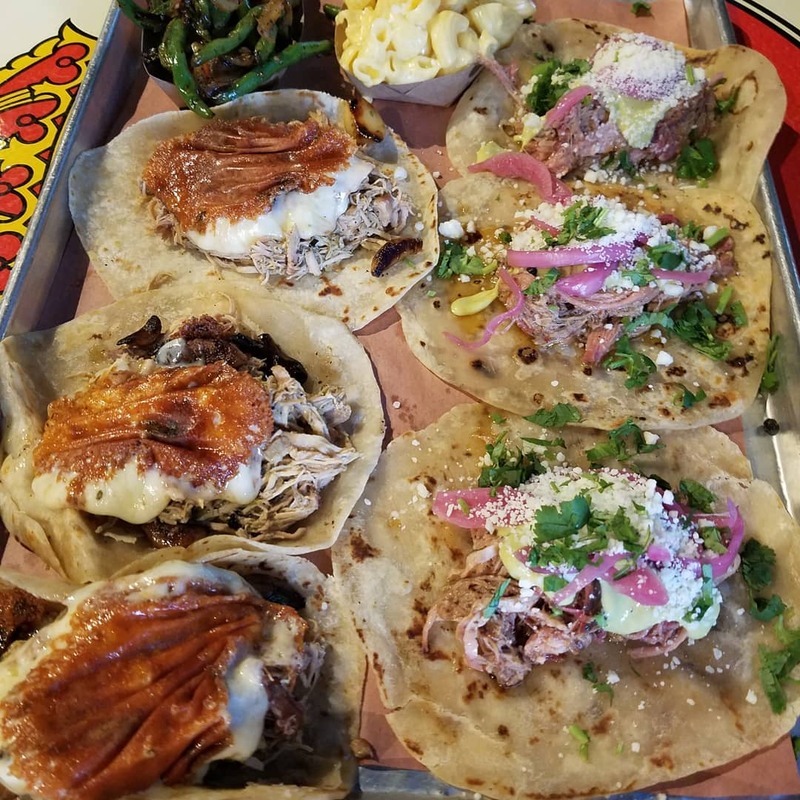 They can throw a trinity plate together with the best of them, but the true star are the brisket, chicken, and pulled pork loaded with Tex-Mex favorites and wrapped in brisket fat tortillas! We had several tacos, and then like the night before we made a second and final order of BBQPalooza consisting of perfect chips and queso and the best smoked frito pie I have had. The Pit Room is another of my top5 Hou joints and if you haven't been put it at the top of your list. BBQPalooza9 contained the largest ever spread, service from one of our own, and the first ever bring your wife to BBQPalooza day. Once again the eating was tremendous, but the real take away was the awesome people of Texas BBQ and how it brings friends together. I had my first experiences at Feges and Blood Bros. and spent time in some of my favorite places on Earth (In the NEW TEXAS BBQ CAPITAL). It's probably time for my yearly month long BBQ hiatus, but rest assured I will be back eating with the rest of you soon! See you out on the BBQ trail! This was the eighth annual bbqpalooza and in light of the distinct Tex-Mex flavor, plus our first trip to San Antonio it was nicknamed "The Ocho". We made six stops in two days. Not our heftiest itinerary, but we have become older and wiser in recent years. The first two stops were legit pig out meals, so rest assured we are all on 200 calorie a day diets as of Monday. The itinerary was up in the air till the last minute (Truth vacations, Hays Co. building, and Sundays being extremely limited in San Antonio all made impacts), and we even made changes on the fly (Leroy and Lewis sold out? Hello Valentina's tacos and Kerlin ribs! ), but in the end some old favorites and new revelations made this version of bbqpalooza as memorable as usual. Our first stop was supposed to be bbqpalooza fav Truth BBQ. Alas, days before we set out Leonard and the gang announced they would be taking a much needed break. I'd be lying if I didn't say we were disappointed, but we quickly rebounded by agreeing to revisit TMBBQ #6 spot Tejas Chocolate! We were honored to be joined there by Andrew and Bryan from bbqpalooza's favorite podcast Tales from the Pits pod. Bryan was able to get us a pit tour (yes....I saw the legend "The Dude" at work) and some great bbq small talk with the always cordial and down to earth pitmaster Scott. Our slight disappointment was quickly turned to good fortune when the food hit the table. Tejas has vastly improved since our last visit (and that was right before being named #6). Some joints can crumble a bit under the pressure of a top 10 ranking, but we all felt Scott and company have accepted the challenge and continued to get better! 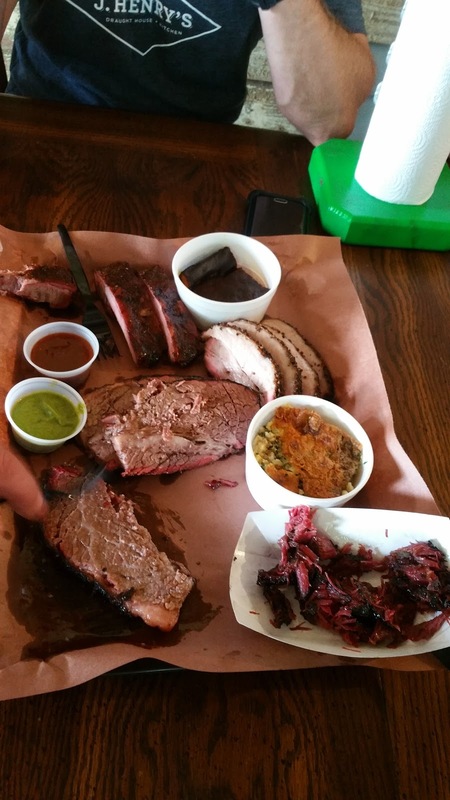 The brisket was excellent, the burnt ends were a treat, and while I am still a huge fan of their green sauce...several bbqpalooza members were in love with the mole. The belle of the ball though was the ridiculously tasty pork belly which disappeared faster than anything on the table. Seriously, I thoroughly enjoyed every visit to Tejas, but I can honestly say I fully understood their top 10 ranking after this year's meal. Thanks for a fantastic kickoff meal! From Tejas we said our goodbyes to Bryan and Andrew (who also graciously provided some swag and koozies for the remainder of the trip) and headed to South Austin. We really wanted to try Leroy and Lewis, but once again our plans were foiled as they were sold out. However....we followed up our Tejas audible with yet another stellar option by heading over to Valentina's new location on Manchaca. Holy Tex-Mex Heaven.....the new spot Valentina's has is amazing! 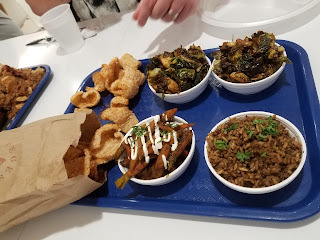 We first went to this favorite when they were a small truck operating outside a bar, then as a larger unit in a run down grocery strip, but now the location feels worthy of the food. They have an awesome seating area and plenty of space. Great decor highlighting their "hecho con amor" slogan fills the much larger spaces and provides a major upgrade on the ambiance factor. The food? Well, my love of Valentina's goes back several bbqpaloozas ago. The tacos are the best in the world. Brisket and pork were amazing, but as we have found in visits past the often overlooked chicken tacos are some of the most flavorful items I've ever sampled. This trip we got to try a beef rib sandwich that made us all believe in heaven (full of Tex Mex food). Someone stabbed me with a plastic fork for the last bite of smoked corn. We had an excellent meal as always and I can't wait to get back to this new location again. 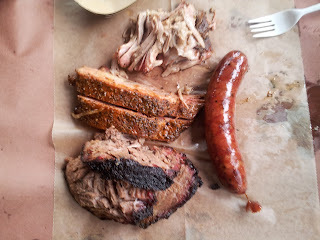 After Valentina's we decided we would go by oft overlooked and highly underrated Kerlin BBQ. It was actually right after their normal closing time, we had to fight through the sxsw crowd with a rousing game of "Hipster or Hobo", and apparently the x games were going on right behind the food truck while some sort of "music" wailed at 9000 decibels.....and still we were blown away by the ribs. Kerlin's had a little food left and luckily for us a few of their juicy, succulent pork ribs. 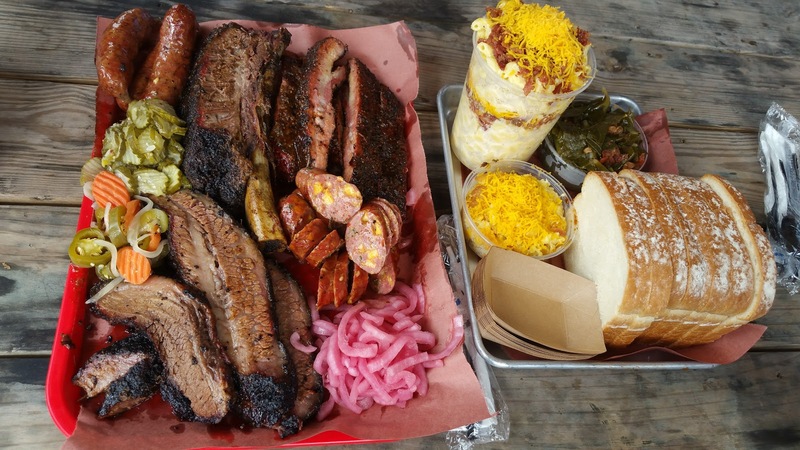 This spot is an excellent option for bbq in Austin and should not be overlooked. We have been a couple of times and I can assure you you'd have a hard time finding a better pork rib even in the tmbbq top 10! Check them out next time you are in Austin. Now it was time to head to San Antonio for the first time. We planned this trip around 2m on Sunday morning, but decided to double dip with reservations at The Granary Saturday night. 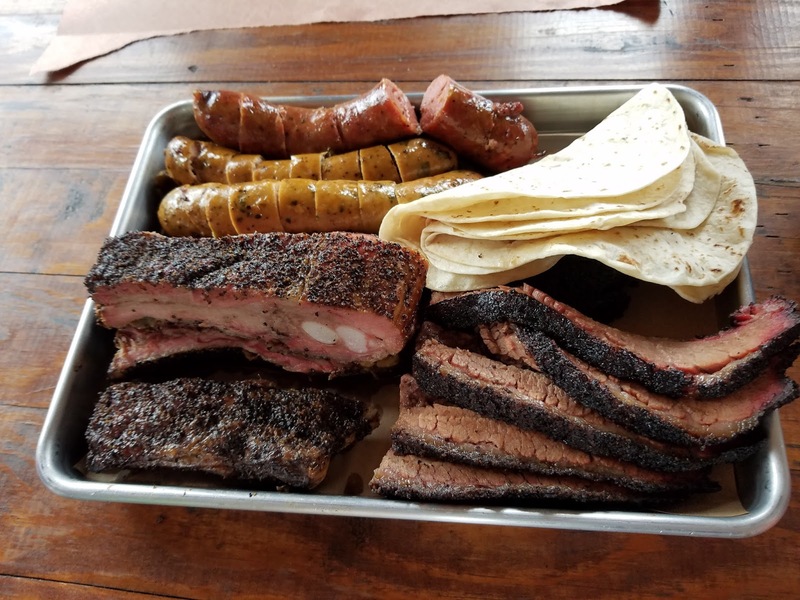 While the dinner BBQ board offered a little to be desired compared to the fare we had that morning at Tejas, the rest of the eclectic menu was a delicious end to a smoky day. The Maitake mushrooms and fried quail were big winners here, and the Texas toast with what they call BBQ butter (as amazing as it sounds) was a personal favorite (I could have downed 20 slices alone). The desserts were much appreciated too....especially a savory chess pie! 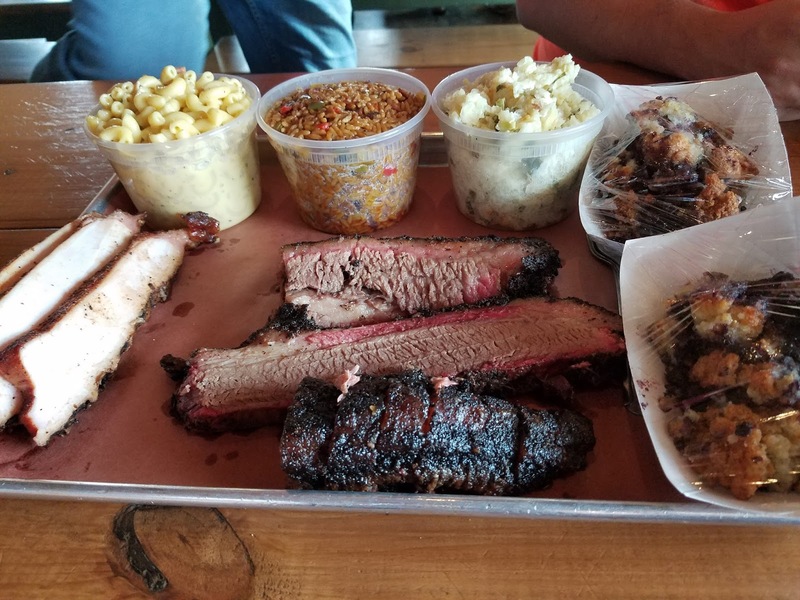 I can't say the brisket we ate was comparable with our top joints, but I could easily recommend coming here and partaking in some extremely tasty off the radar menu items that you will definitely not find on any other bbq joints menus. If Valentina's is Tex-Mex heaven......then 2m is Tex-Mex Nirvana. What an absolutely AMAZING tray of Tex-Mex goodness! First, the trinity.... for those anxious traditionalists.....is LEGIT top 10. Excellent bark and fat rendering for a well better than average brisket. Ribs were right there with Tejas and Kerlin, and the sausage......the SAUSAGE! The pork sausage with serrano and Oaxaca was possibly my favorite item on the trip! If that doesn't do it for you let me drop our sides list: Chicharoni macaroni, borracho beans, pico de gallo, and pickled nopales!!!!!! SHUT. IT. DOWN. BBQ fans.....this was a top 3 sides spot for me. Add in homemade tortillas and I could seriously eat this meal EVERY day for the rest of my life....no complaints. (As seen on TV voice) But wait! We're not done! Because 2M follows that up with a top 3 dessert as well. Think Micklethwait moon pies or Truth cake. These guys crank out daily tres leches specials! We got to sample peanut butter and red velvet tres leches and it was as savory as the meal. Several very happy glances were exchanged across the table and the feeling I had post meal at 2M was probably the best I've felt since the Astros won the World Series.....that good friends. If you are in San Antonio....or within 200 miles of it I highly recommend sampling 2m soon. Get there early, because the Sunday we were there they sold out in 2 hours....and it is easy to see why! We were ready to head back to the homeland and close out the weekend for the second year in a row at a personal favorite Pinkerton's. Grant is one of the best dudes in BBQ, super friendly, welcoming (it is literally his HOUSE), and he was really involved in the Harvey recovery efforts. Sunday he was out at the rodeo (he's also a big supporter of the FFA community) so we missed him, but his terrific staff he's put together had the Q on point as always! My love of Pinkerton's has been well documented (even my wife and daughter are always begging me to take them back), and this plate was no different. We ate some of Grant's now World Famous "candy painted" ribs (soon to be the most popular shirt on the BBQ market). We had some brisket and burnt ends.....several members said it was their favorite brisket even as the last. Sausage was on point as well, but the last few visits I have been blown away by Pinkerton's smoked turkey! It is not to be skipped on. I especially like it with a little of the homemade BBQ sauce that is supplied in a tub for you. So....so...good....like any BBQ lover I search out that brisket (Pinkerton's is top tier), but I could definitely eat a whole meal of that turkey and not feel cheated at all. Of course, what would any Pinkerton's meal be without a side of duck jambalaya? So we cherished that last meal, purchased a few to go orders for family and friends and closed the book on bbqpalooza "the ocho". All in all it was another tremendous weekend of Q, friends, and gluttony. Tejas started it off by setting the bar extremely high. 2M was an absolute REVELATION. Pinkerton's sent us all home full and happy. In between we visited old favorites like Valentina's and Kerlin's, and had a very eclectic BBQ meal at The Granary.....oh and don't forget that 30 day dry aged steak (I know The Oak won't). Thanks to all the spots that hosted us and friends who tagged along on the way! See you guys out on the BBQ trail! When we started bbqpalooza 7 years ago it was the passion of our good friend Chris Hicks to go off in search of the greatest BBQ that Texas, and thereby the World, had to offer. 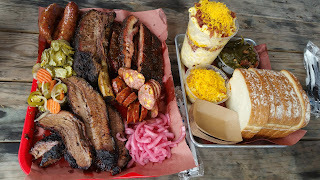 We had to venture outside our home base of Houston, because while being the greatest city in the greatest state in the greatest country in the world it was surprisingly lacking in life changing BBQ. Our adventures took us to Lexington, Taylor, Giddings, College Station, Lockhart, and of course the capitol ...Austin. We ate BBQ that literally changed our lives. We documented it. We blogged about it. We talked about it until our wives put a moratorium on meat talk. And then a funny thing happened....we started to notice that good BBQ, great BBQ, even LEGENDARY BBQ began popping up right here in the H. This year we decided the time was right to show H town some love. We have spots where people wait hours, we have spots just as eccentric as Austin, heck...we even have our OWN BBQ festival now! It was time to represent for our hometown. Before we get into the trip let me address the giant elephant in the room. 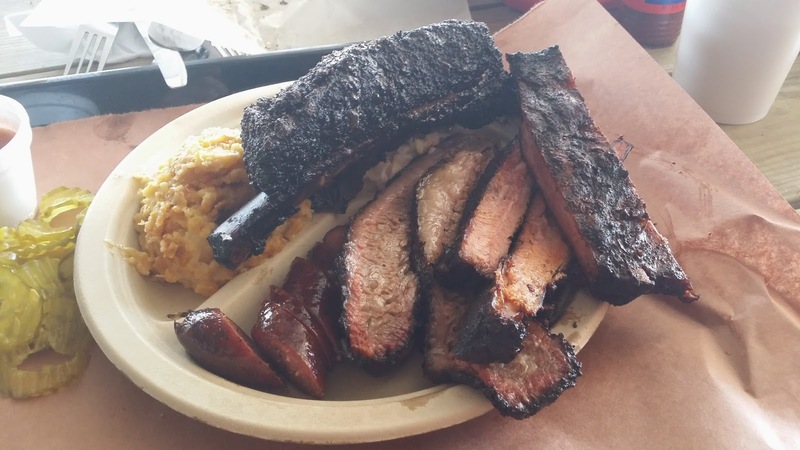 When most people think of Houston BBQ the two places most likely to come up are Killen's BBQ and Corkscrew BBQ. Both are tremendous joints that are absolutely in the top 50 upper tier, however we have visited these fine establishments.....ALOT. Killen's is our closest top 50 joint and combined we have feasted there no less than 25 times....with many more meals to come. Corkscrew is a personal favorite of mine and we have also frequented this establishment more than 10 times the past few years. Both are MUST TRY for any BBQ aficionado and I can't recommend them enough. In fact, I would be mistaken if I didn't acknowledge that much of the Houston BBQ explosion and thereby the idea to do BBQPalooza2017 at home can be traced back to these two meccas of meat. We left them off the trip, but rest assured they are two of our very favorites. One favorite we did return to this year is back where it all started....Snow's BBQ in Lexington. 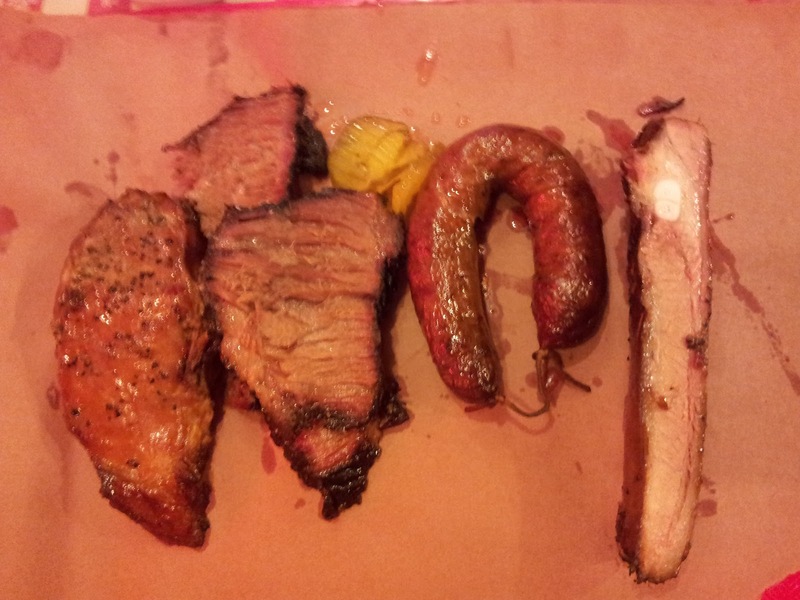 My feelings on this previously awarded #1 BBQ joint by Texas Monthly are well documented. This was the first spot BBQPalooza ever journeyed and it holds a special place in all our hearts. Ms. Tootsie is the hardest working, most generous, and hospitable pitmaster to ever tend a fire. And oh by the way...she has been churning out central Texas BBQ that is universally acknowledged as some of the best in the world since before that stuff was documented. The brisket has never been sub 10 out of 10 in any of my trips here. This particular time we were all impressed at the higher quality of ribs than what we felt we got last time. I started getting chicken here 3 visits ago (not a part of my usual order) because it can't be missed. Top it off with some jalapeno sausage and you quickly realize why showing up at 8am at Snow's is the best breakfast Texas has to offer! Now we were headed back towards Houston and stopping at a joint none of us had ever been to: Truth BBQ in Brenham. We had varied levels of excitement as we waited about 6th in a line of roughly 15 for the 11am opening. The spot is fantastic, right off 290 with recent additions to outdoor seating and great Texas decor. We got up to the counter and immediately noticed the color, consistency, and smell of the brisket was outstanding. We forgot all about having to eat at 4 more spots and ordered several pounds of meat. 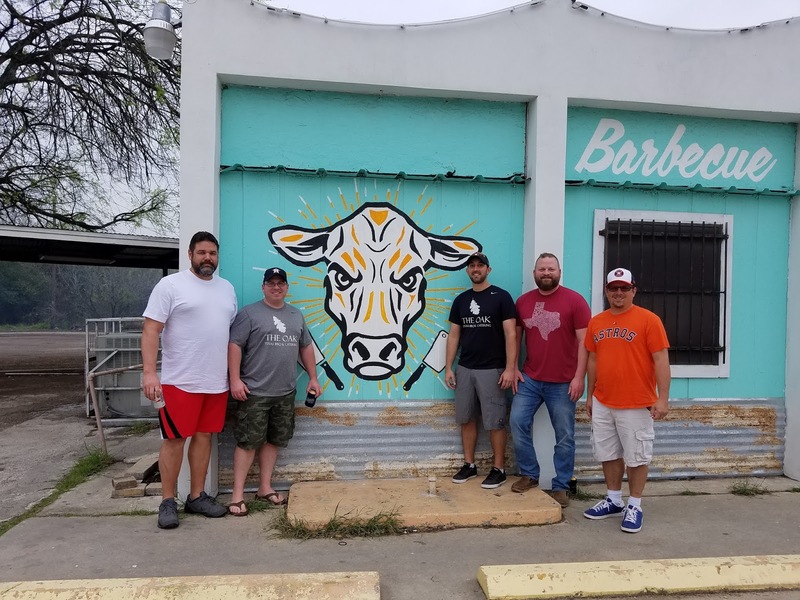 This is where owner/pitmaster Leonard Botello went next level on us. LOOK AT THAT PRESENTATION ON THIS PLATE OF MEAT! No....look at it. I could hang this picture at the Louvre! Most BBQ lovers know the importance of presentation, and Leonard was the best I've seen. The care he took to make our plate reminded me of the first time I held my firstborn....making sure everything was in place and its full beauty could be appreciated. He thrice moved our perfect beef rib until he got it in just the right spot....being sure to show us the jiggle (even giving it a love tap) like some kind of cameraman on the set of Baywatch. Leonard threw on about 10 pieces of burnt ends that nearly caused a knife fight in line. By the time we paid we were full of the type of anticipation usually reserved for a line of lightsaber wielding nerds at a midnight premiere of the newest Star Wars movie. Then we ate....and ate...and ate. Very little was said for roughly 20 minutes. There was nothing on that plate that wasn't top 5 I'd ever had. 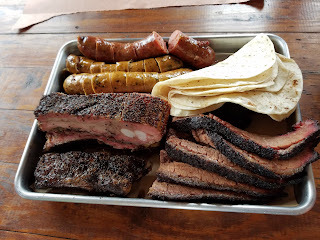 Brisket that had a perfect pull with the thumb and forefinger, ribs that were cooked perfectly, house made sausage that had a perfect consistency, a beef rib that was the BEST I had ever tasted. 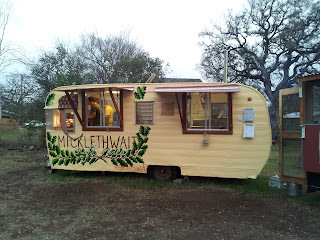 The mac and cheese, corn pudding, and greens were Micklethwait level sides. By the time we had contemplated what was happening ridiculous comments like "Best meal I've ever had", "Greatest meat spread in Texas", and "Might be #1....period" were being brandied about. It was that good.....and then we ate some of Leonard's Mom's cakes....God Bless Texas. Apparently it's not enough to possibly be churning out the world's finest BBQ, but Truth also delivers the best cake I've ever had (Banana Caramel was the favorite and most fiercely fought over). Truth BBQ was an absolute revelation. I'm going to be honest....from here on out any top BBQ list that neglects to include Truth BBQ is automatically going to be disregarded. Our final stop before getting inside the city limits was at Tejas Chocolate Craftory in Tomball. This is a real family labor of love. We got to speak with Scott (the BBQ brains), Michelle (the Chocolate maker) and Scott's son who was working too. You can't find nicer people in the business or a better setup than they have there in Tomball. Craft chocolate, beer, and bbq in the middle of the shopping district with an awesome outdoor seating area. The meat was delicious (we were especially fond of the pork belly) and my wife can vouch for the chocolate I offered as a peace offering upon my return. The Craftory is appropriately named as this truly is a factory of craft foods and drink. If you are in the Tomball area, I can't imagine getting a better meal or having a better time than you will at Tejas Chocolate. Now we headed towards a spot I alone had previously been to ....Roegel's Barbecue. I was a little disappointed owner/pitmaster Russell would not be there this visit (I think he was doing his own BBQ trip to NY), but he left a message for right hand man Bruce who took tremendous care of us! Roegel's brisket is top notch. The rest of his trinity is excellent, and I can tell you the boudin we procured was the first thing gone. Bruce asked us about our trip so far and heard us mention the Truth beef rib. We didn't order a beef rib as we all felt incapable of conquering another so late in the day, however Bruce cut some tasty morsels off one and I can verify they were eaten with zeal. Nobody in Houston can make a better beef rib, and I still have the Thursday only pastrami (one of the most sought after meals in H town) on my personal bucket list. Getting a personal pit tour from our gracious host Bruce was the icing on the cake. I already knew it, but now our whole group could recognize that Roegel's belonged with the best BBQ Texas has to offer. Extremely proud of the quality of meat they are cranking out each day from my hometown. Keep up the good work Russell, and tell Bruce we said thanks! Now we were feeling it.....but pressed on to The Pit Room. 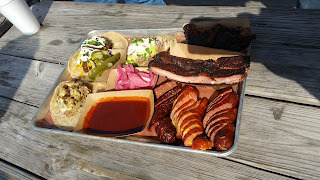 The first time I had Valentina's in Austin I was blown away.....REAL Texas BBQ melded with Mexican cuisine....everything great about Texas. Well, now you can get a similar experience in Texas' most diverse city. The Pit Room can throw a trinity down to rival many top 50 joints but let's be honest, the stars here are THOSE TACOS! Brisket, pulled pork, and chicken topped with the likes of cilantro, griddled cheese, pickled red onions, charred garlic, salsas (verde and rojo) all on top of tortillas made with brisket fat! What is the perfect thing to follow up 4 BBQ plates? BBQ tacos of course! These guys do a tremendous job and I'm really glad somebody took the BBQ/Mexican pairing and is doing it at such a high level here in the city. Get to The Pit Room and get yourself some tacos ASAP. At this point several members were questioning the need to make our final stop. Stomachs had stretched, belts had been adjusted, mini vans smelled like BBQ pits, but we pressed on to our final destination...Pinkerton's Barbecue. If The Pit Room is Houston's Valentina's, then Pinkerton's is very much Houston's Freedmens. A plush set up, craft cocktails being churned out from a full bar, and barbecue rarities like duck and sausage jambalaya set this place apart from the rest. We were extremely glad we sucked it up and came to our last spot. In fact after tasting the brisket, sausage, ribs, and jambalaya we actually ordered seconds .....AFTER 5 MEALS! I can't think of a higher compliment or recommendation than that. Owner/pitmaster Grant Pinkerton was nice enough to come by the table to talk some Q and marvel at the day's accomplishments. He seemed like an extremely cool guy to hang out with earning bonus points for mentioning the new TV's coming in just in time for Astros season (he's a huge fan too!). The vibe of this awesome hang out place seems to reflect his personality. We all agreed that we needed to come back with some friends one evening (when not engorged on BBQ) and spend some time really appreciating all that Pinkerton's has to offer. If you're looking for a place in the Heights to bring some friends and possibly blow them away with real authentic Texas BBQ head here. I can't imagine any best of list leaving this jewel out. Even though we had doubled down on our sin of gluttony we couldn't stop talking about the quality of meat Grant and his staff produced. It was time to head home. We were full: of meat, drink, dessert....but mostly full of pride. Our city represented... and if BBQPalooza2017 taught us anything (besides that we may all want to start practicing some moderation) it was that you no longer need to travel away from Houston to experience the very best Texas BBQ has to offer. You want a chocolate/beer/smoke meats craftory? Check. Do you prefer a traditional spread with top shelf beef ribs? Check. Care for tacos that perfectly blend the Tex and Mex sides of our state? Got it. Want to entertain friends for an evening of BBQ that will knock their socks off and discuss the meal over cocktails? Can do. Are you searching for the VERY best meal you've ever experienced? May not have to go farther than an hour. Snow's was the solid beacon it always is, each of the Houston spots brought something different and represented our hometown extremely well, and the Truth is.....Leonard might just be smoking the finest BBQ in all the world! The annual bbqpalooza trip opened with a somber start and ended with a loud bang. 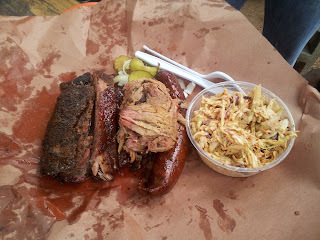 It featured seven previously visited favorites, Franklin BBQ minus the line, and one new top 50 crossed off the list. Over TWENTY pounds of meat was consumed and a great time was had by all, but as always the people who create the smoked goodness will be remembered long after the meat itself is forgotten. Our next stop took us to Belton where we got to cross off a brand new Texas Monthly top 50 off of our list.....Miller's Smokehouse. The set up is sneaky as it seems a lot smaller than it really is. Several smokers are cranking meat out back and if you walk from the front room to the next section (which we were at first unaware of) there is a much bigger seating area/ bar. Miller's has only been around since 2008, but it was easy to see how they cracked the list. Juicy sausage, great ribs, and some tremendous burnt ends were devoured. The people are extremely friendly and the service was top notch. Do not....I repeat DO NOT skip out on the banana pudding. From Belton we headed into the capital of Texas and BBQ....Austin. We first headed to an old favorite Valentina's Tex Mex BBQ. If you are like me and your two favorite food groups are BBQ and Mexican.....well then my friend Valentina's is quite possibly your Disneyland. 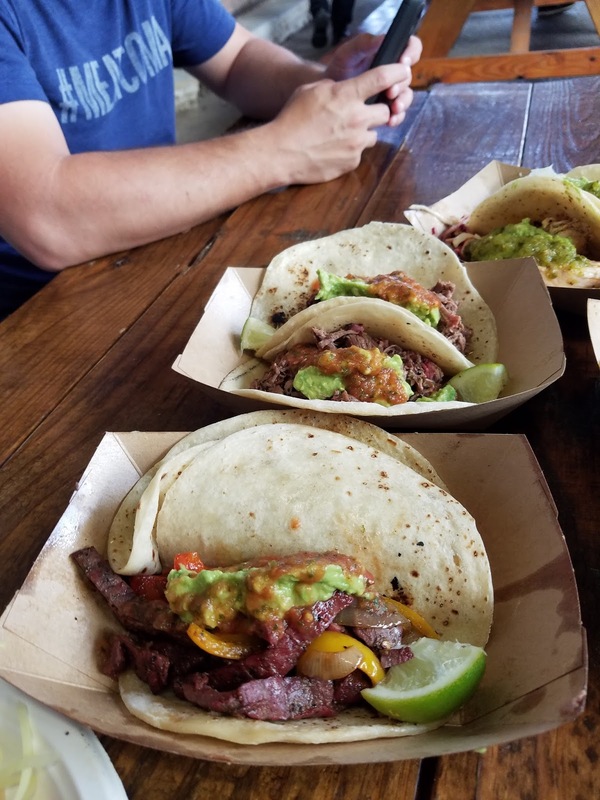 Melding top central Texas smoked meats with the spicy goodness of Mexican guacamole, salsa, and tortillas, Valentina's is a Texan's oasis. 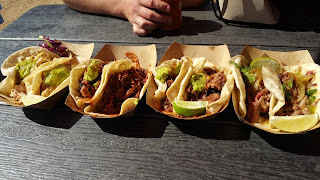 We had chicken, brisket, and carnitas tacos and they were all flat out amazing. The set up for the food truck isn't quite as nice as it used to be next to Star Bar (now it's located in a gas station parking lot), but somehow the food was even better than we remembered. Valentina's is an absolute must for any serious BBQ/taco enthusiasts. Our final stop on Saturday evening was Freedmen's Bar, a retro style BBQ/cocktail bar in a building built in 1869 that has served as a church, a publishing house, and a grocery store to name a few. Freedmen's is an awesome spot, and of all the places on the list serves as the best BBQ spot to take a date on or for a dinner out with close friends. The food is always top notch. Besides the amazing BBQ (we had a few holy trinity plates), the house made pickles, bread and pimento, and smoked banana pudding and mousse really stood out. I can say as an aside that the brisket this time was too thickly cut for our preferences, but was the only dark mark on an otherwise great meal. It was time to enjoy Austin for a while before we headed back to rest up for day two. The next morning featured a feat I'm not sure has ever been replicated. A few years ago we picked up Snow's and ate it in line at Franklin BBQ....well this year my friends we were able to get a to go order at the World Famous Franklin BBQ and eat it with our 3 meat plate from the World's most iconic food truck Micklethwait Craft Meats!!!! When half our party showed up at Craft Meats and unwrapped the Franklin goodness to indulge in as we waited, a group in front of us literally said, "Guys....I think that's Franklin's....we may have just been one upped." Yes my friend....yes you were. Side note: we did share a few brisket bites with our fellow BBQ enthusiasts. 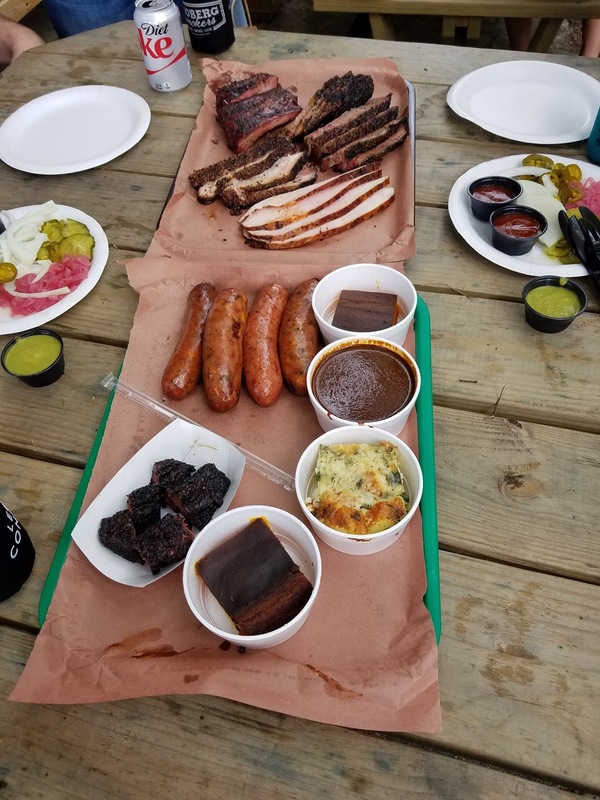 Talk about a meal...All I can remember was Franklin brisket, ribs, amazing Micklethwait bread, Craft Meats hot links, and BEEF STRIP LOIN! It was like a meat lover's Christmas. From Craft Meats we headed over to check in on John Mueller, and let me assure you that the rumors are false....John is still cranking out his delicious BBQ as the bad boy of Texas Q. 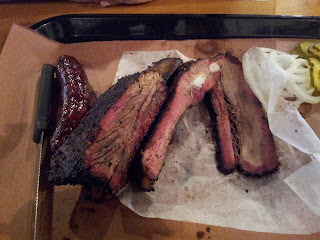 In fact, it was probably the best brisket we had ever had there. Add in the always elite sides like cheesy squash , and the world famous thin sauce, and we were in for a real treat. In a huge upset John was extremely friendly that day thanking us for coming by and seeming to be in a generally good mood. Really I'm not sure how he could ever be in a bad mood cranking out plates like the one we had that day. We're big fans of John Mueller Meat Co. and never miss a chance to see John and get some of his legendary food. Finally it was time to wrap up the trip at one of our very favorite spots Stiles Switch BBQ and Brew. Owner Shane Stiles and head pit master Lance Kirkpatrick are two of the coolest guys in the business. Their demeanor leaks over into the restaurant making Stiles Switch the best BBQ hangout around. Lance took us on a behind the scenes pit tour and gave us some info on new techniques he had been trying. You can always tell Lance and Shane's excitement for their craft and after sampling the goods it was easy to see why they were so excited. The Q that Lance and his crew are spitting out just keeps getting better! The brisket was amazing, the sausage was delicious, and most of all the new ribs were an explosion of flavor. Most of the joints on this list stay open a few hours or until "sold out", but Stiles cranks out Q for their huge crowds Tuesday-Sunday from 11am until nighttime. Just seeing all the meats they were smoking for the "night crowd" was overwhelming. Stiles Switch manages to smoke meat at the same level of the big guns.....and do it at about three times the output. These guys deserve all the success they're having and I sure hope we're still visiting this favorite decades from now. BBQpalooza was actually started 6 years ago by our good friend Chris Hicks. He felt like he needed to share his immense love for Texas BBQ with a few of us close friends (especially a recent Michigan transplant) and it blossomed from there. Chris is moving this summer to Nashville, but assured us that BBQpalooza will live on. Hopefully he can make some new Texas BBQ converts in Tennessee. There was a feeling of one last hurrah on this trip, and although we know it won't be the last it was great to spend the weekend with good friends who can bond over BBQ. When we get back each year, everybody always asks what was the best? The best? The best is sharing a moment with a grieving mother who has given so many others joy over the years. The best is being able to share a world class piece of brisket with a complete stranger and being able to communicate with someone you never met through a simple nod. The best is getting to listen to an artist like Lance Kirkpatrick convey his love for the craft he does so well. The BEST is getting to spend a few hours with some of the best friends each year eating till we are sick and loving every minute of it. 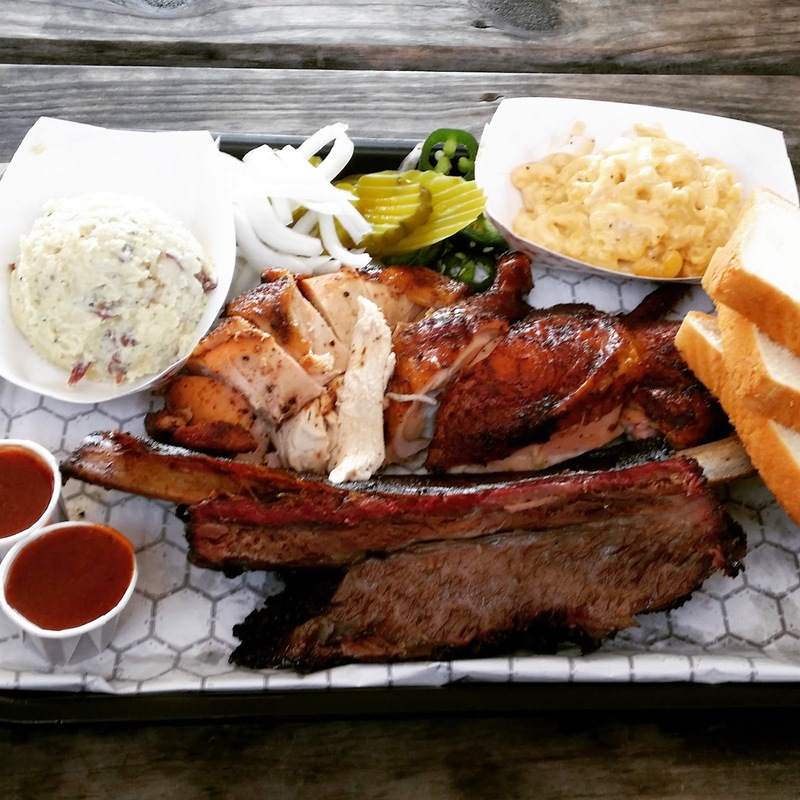 BBQ is just food sure, but in Texas it's way more than that. BBQ is friends and family. Many things in this world fail to last 5 years: Presidential terms, a quarter of all marriages, your expensive cell phone, the average NFL career....all these things can now take a backseat to the longevity of BBQPALOOZA. 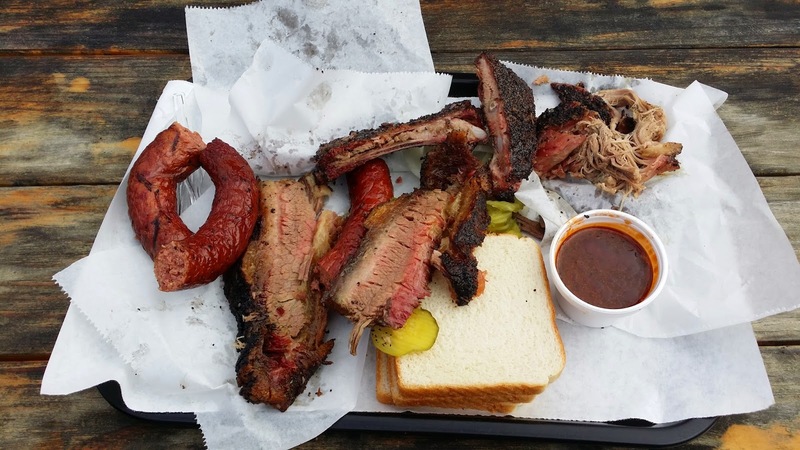 What started as a hair brained idea to sample delicious Central Texas BBQ has morphed into a yearly trek across the lower half of Texas in search of the very best Q. It's a two day homage to the greatest state and the greatest cooking method in the history of humankind. Is it ambitious? Yes. Is it exhausting? Yes. Is it 48 hrs of smoke drenched euphoria? Absolutely. As we get older some things change, we've now got enough offspring that we were able to procure a pimped out minivan for this year's fest. 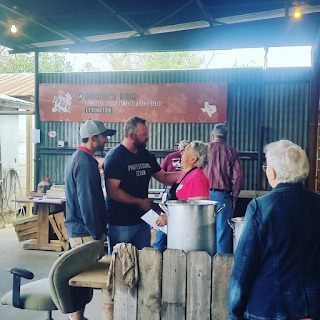 We're not the first or the last group to do a BBQ tour (let's be honest Daniel Vaughan probably equals this trip 40 or so times a year), but in our minds it's a little like Thanksgiving, Christmas, and Texas Independence Day all wrapped up in one. And each year I get to document the trip right here....hope you enjoy. When we started this bad boy 5 years ago we were so naive. Rating and ranking the very best of the best? Trying to eat 8 spots in a single day? Avoiding Austin? All these mistakes have been rectified. I get asked a lot, especially after BBQPALOOZA, Stephen, "What's the best BBQ in Texas?" Well, I just can't throw ranks out there anymore. After meeting the pit masters who spend hours every night stoking fires, rubbing meat, drinking copious amounts of espresso....I can't just rank 1-10 and call it a day. Is Led Zeppelin superior to The Beatles? Does Willie Mays pale in comparison to Mickey Mantle? Ginger or Mary Ann? I mean....some things exude so much excellence that they demand to be appreciated on their own and without comparison. Texas BBQ has become that way for me. So if you're reading this to organize a list stop here, but if you want to know a few of the things that make each of these spots fantastic temples to meat then you came to the right spot. Our first stop this year was Corkscrew BBQ. 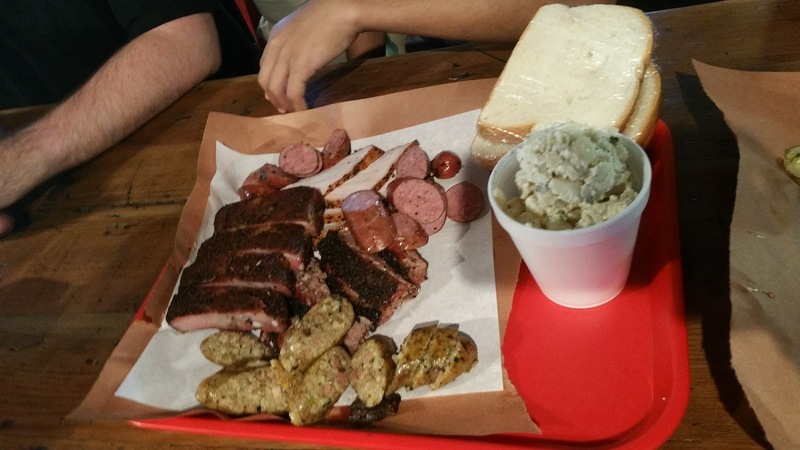 This Texas Monthly top 50 is in Spring and boasts some of the very best smoked meats near our hometown of Houston. A few of us had been to Corkscrew before so we knew to arrive early enough for a number and then procure a picnic table to sample the smells and await our spread. Corkscrew does not disappoint! 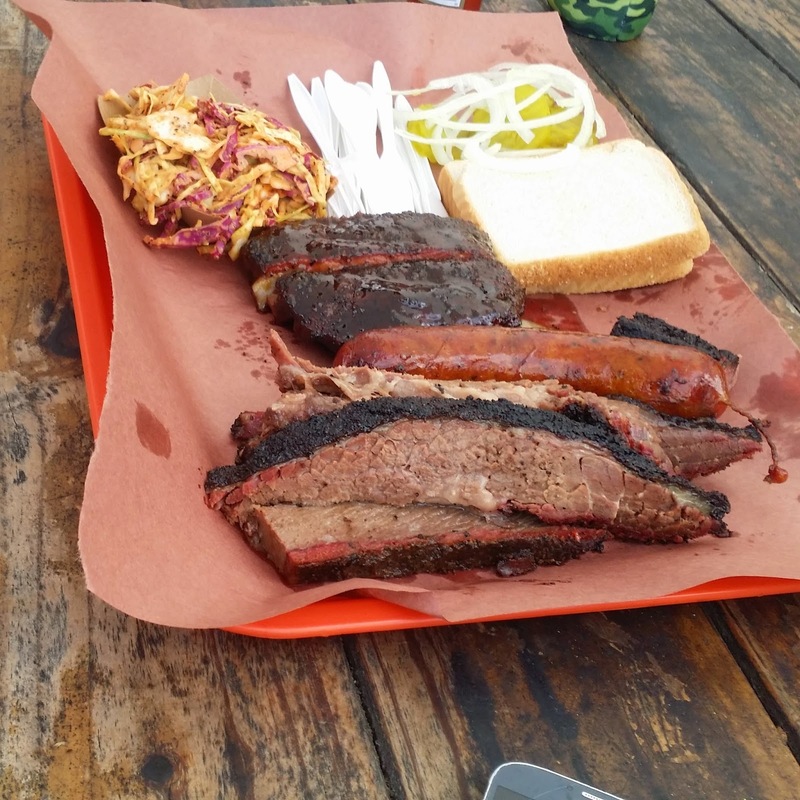 The moist brisket would be right at home with the very best in Austin. The pork ribs and sausage are well above average. The beef ribs are enormous and have great texture. This was my first time to have the chicken, and I must say ordering that was a tremendous choice! We usually skip the poultry, but bar none, everyone claimed that pit master Will's smoked bird was quite possibly the best we had EVER had. Pro tip: arrive early to get a number and come on a Saturday when it's the only day of the week Corkscrew offers beef ribs, chicken, and free beer. From Corkscrew we headed out to Bryan for our first ever visit to Fargo's Pit BBQ. Fargo's was pretty busy but owner Alan Caldwell made sure we had plenty of seating. His moist brisket has a unique taste that is delicious and distinctly Fargo's. The ribs and sausage were good too and it wasn't surprising that this little spot in Bryan has been named a Texas Monthly top 50. Alan is a really nice guy but don't try to get him to tell you his secrets, when we inquired about what wood he used to get that distinct taste he shot us down like a frat boy approaching Katy Perry. He even keeps a tall fence around the pit out back in case anyone thinks they're going to cop a peek or snap a pic. Keep that secret up Mr. Caldwell it's obvious the people love what you're doing. Since we were in Bryan already we decided to head over to the new Kreuz market in Bryan. We've sampled the original in Lockhart, but in a shocking turn of events this spread may have actually outdone the original. Juicy, flavorful brisket and some of the best sausage of the trip were on full display here, but the real star is the pork chop/ homemade sauerkraut. If you ever go to any Kreuz location DO NOT miss the pork chop and sauerkraut. Just like in Lockhart there's no forks and no sauce, and I can verify that neither are needed. If you find yourself near Bryan and want some authentic central Texas BBQ head to this spot and you will not be disappointed. After Kreuz we headed to Austin and the current "Capital of Texas and Texas BBQ". We had an evening reservation at last year's biggest revelation Freedmen's Bar. This time there was no argument about what we were ordering.....The Texas Trio. We procured some soy marinated pork cheek as well, and let me assure you that it was the most flavorful bbq/asian assault on my taste buds possible. Pit master Evan LeRoy's brisket is top notch and so is the sausage. The ribs really caught us off guard this time as they were even more flavorful than we remembered. Freedmen's is what I like to call "classy" bbq (fancy and located in a historic building specializing in retro cocktails and the like), but do not let that fool you.....plenty of pit masters toiling at pop ups would love to be able to replicate the taste Evan does with his authentic Texas Q. Two years running Freedmen's has been on every one of our minds as a top meal of the weekend. We woke up the next morning on day two and as always we wondered, "How in Sam Houston are we going to eat more BBQ all day?" A banana and coffee later we were sitting at la bbq as the undisputed firsts in line and by 9:45 when the pits were spilling out that amazing smell......we all caught our second smoke....I mean wind. Let me tell you....NOBODY can put together a better spread than la. Few can equal and many can try, but the combination of perfect moist brisket, delicious pork ribs, and a sausage that was top shelf....is the reason many refer to la as Franklin's minus the line. Don't be fooled though, you still have to get there early or it's going to be at least a 1 hour wait on busy days. 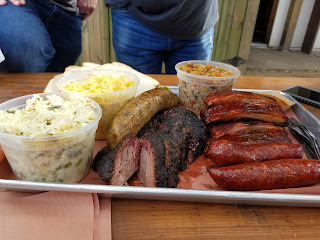 Apparently John Lewis is starting a new bbq adventure in South Carolina, but as luck would have it he surprisingly rolled up to the spot right before opening so we also caught a glimpse of the "pound for pound" best pit master in Texas. Great start to day 2! 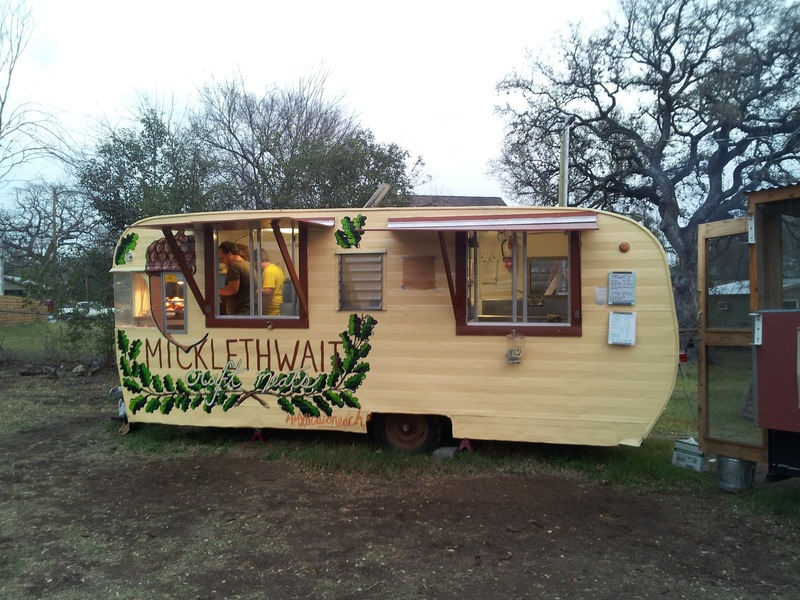 From there we traveled to what is for my money the most iconic structure in Austin ..... the Micklethwait Craft Meats trailer. Tom is a wizard of meat who has recently won beef rib contests, appeared on Jimmy Kimmel (Microwave), and apparently gotten a LOT more popular. He was sold out of beef ribs an hour after opening! At this perhaps most hipster of all Austin BBQ joints you can get a spread as good or better than the rest, but what steals the show are all the things you can't get anywhere else. Known for his ridiculously good sides, Tom takes pride in everything he serves from the best homemade bread to house grown pickles to the straight from dessert heaven moon pies we brought back to our wives to bank some goodwill for next year's trip. 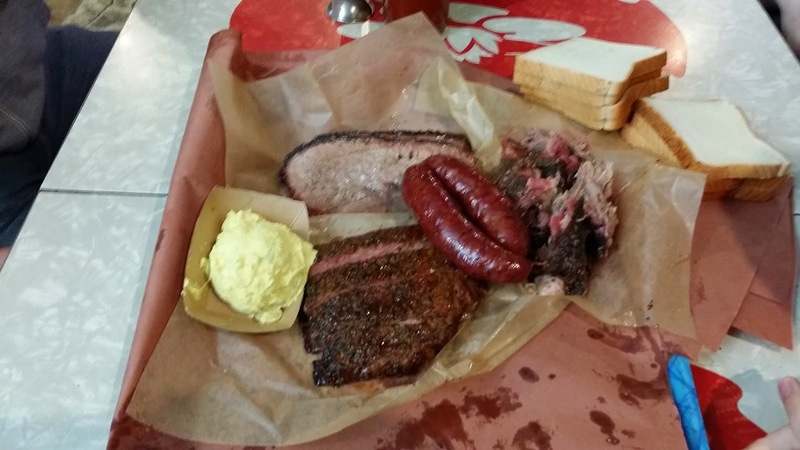 Micklethwait delivers on the smoked meats AND everything else. 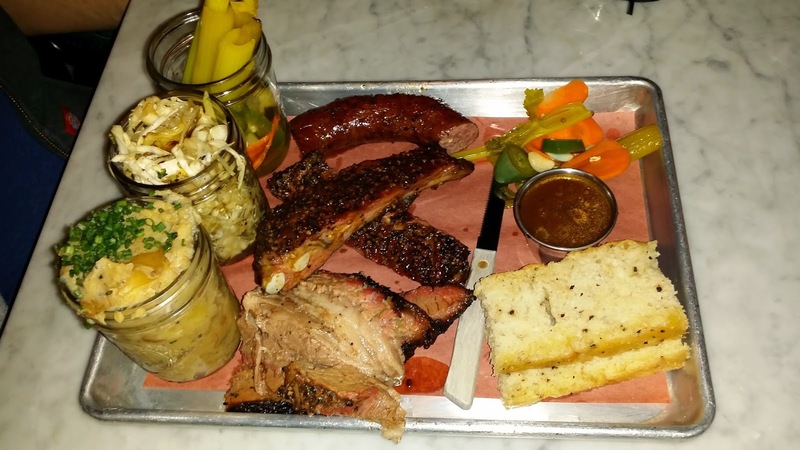 If you want world class Q, but are also craving sides and desserts that will put you into a food coma for hours then look no further than Craft Meats. Barely able to contain our laughter and our contentment from John we headed over to the last new spot on our itinerary Blue Ox BBQ. We planned to sample and head out, but ended up staying here the longest of any stop. We settled in and enjoyed an impromptu set from Wood and Wire that was the perfect soundtrack for BBQPALOOZA. Blue Ox has a fantastic setup in the backyard of the Buzz Mill coffee shop and bar's backyard, and we thoroughly enjoyed it. The owner and pit master Chase was an incredibly cool dude who offered us some free burnt ends and gave us a tour of the pits (once owned and operated by none other than Aaron Franklin himself). 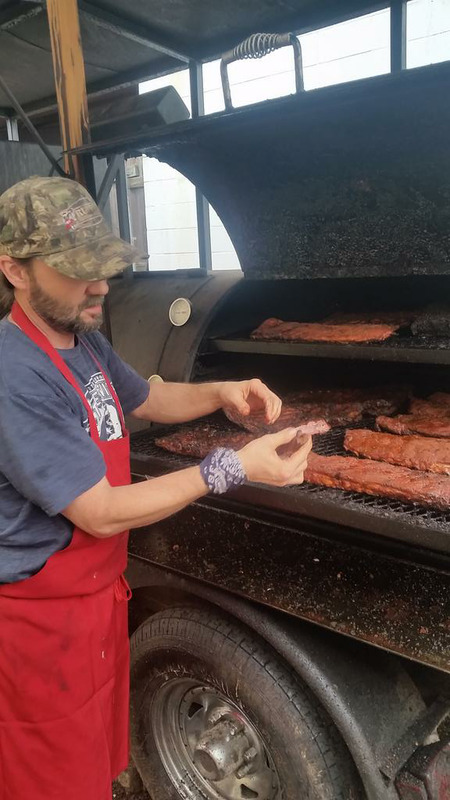 Franklin would be proud to know that Chase is using those pits to optimum effect, cranking out some really delicious brisket, sausage, and ribs. The real star of the show was the pork tenderloin which was without a doubt the best I've had. I can't think of a better brunch idea than getting some drinks from Buzz Mill and sampling Chase's smoked meats. Blue Ox was fantastic and I am really glad we were able to add it to the lineup WE WILL BE BACK. Barely able to walk and running on BBQ fumes we went over to Stiles and Switch for our last stop. Throwing washers on Shane's back porch and sampling some of Lance's tremendous Q has become a BBQPALOOZA tradition. Shane and Lance were gone to an event for SXSW, but they graciously left us a new invention that seemed personally designed for our pleasure.....the Notorious R.I.B. 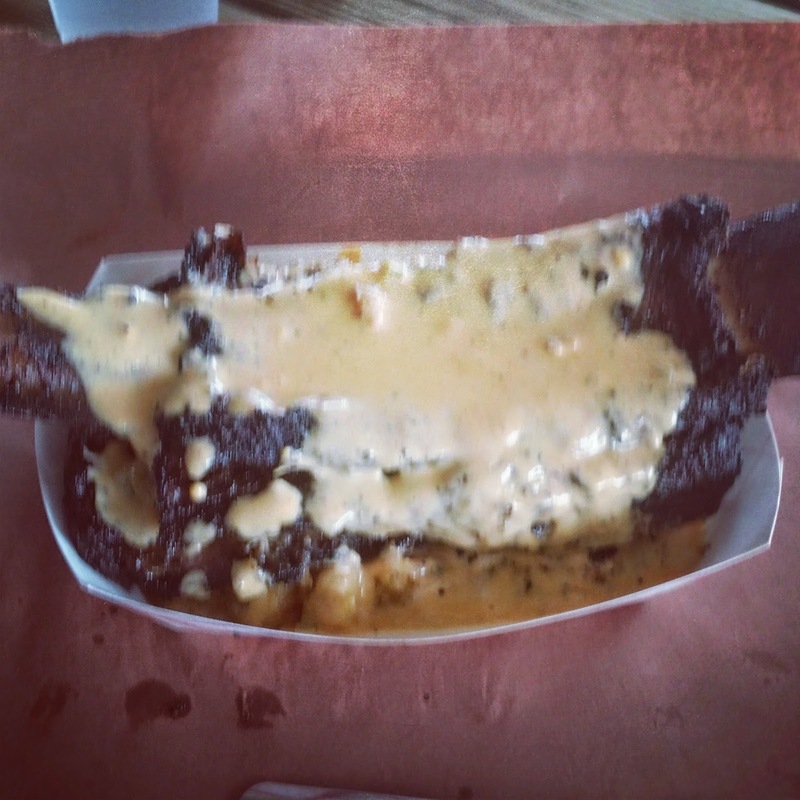 It's one of Lance's rich delicious beef ribs on a spread of tater tots with homemade queso poured over it...I KNOW. We decided that the Notorious R.I.B. was the perfect closing number for our little dance and we were right. Stiles has got some flak for "desecrating a beef rib in a nontraditional way", but to that I say "Get off my lawn old BBQ men!" Shane is not forcing everybody to order their ribs that way...you can still have it traditionally. Stiles and Switch has the same vibe the building carried in Dazed and Confused (it was the Emporium).....fun and good times. You know what the Notorious R.I.B. was? Fun....and good times, and for us the perfect time to add a little queso and carbs to the menu. Sometimes things just come together: the 1995 Rockets playoff run, the Sgt. Peppers album, the cast of Breaking Bad, and the 2014 #BBQPalooza. All epic. All spectacular. All full of several important decisions. 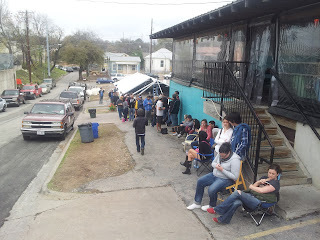 We arrived bright and early in Austin on Tuesday to get into the world famous Franklin's BBQ line. We had a tight itinerary that had been perfected over several weeks. When we turned the corner at 8:20 am to see the longest line we'd ever encountered, the wind flew out of our sails. We decided to get in line anyway, but a Franklin employee came by to get our order and said we'd be eating around 1 pm. There we were in a figurative BBQ studio with a sauce slathered Jim Gray anxiously awaiting our decision. Would we stay in line and possibly have to scratch several plans (probably the uneducated decision we would have made a few years ago), or would we scratch the plans and embrace a new path? Like LeBron we decided to "take our talents" elsewhere and that was the domino which started a chain reaction of great decisions, great timing, and most importantly great barbecue. We left the line vowing to wake up early the next morning and be at the front. Franklin's could wait until tomorrow. We would be heading for John Mueller Meat Co. Now it is widely known that John is the unchallenged bad boy of Texas BBQ, which some complain about, but I've always thought only adds to his mystique. He didn't disappoint. We made the slight mistake of standing by his fence too early and he snapped a pic of us (one member had a @BBQsnob t shirt on), "I'm sending a picture of you jackasses to Daniel. He'll get a kick out of that shirt." He may or may not have intimidated a few of our group. One thing John is always hospitable about.....MEAT. You don't like your BBQ with a little attitude? 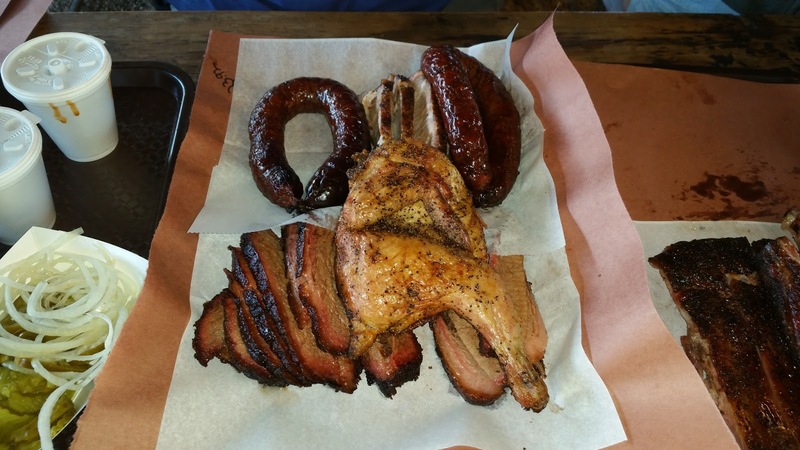 Fine, go somewhere else, but know that your search for the best Q in Texas is severely lacking if you've never sampled John Mueller's smoked offerings. His brisket was tremendous, ribs were delicious, and we were all blown away by the meat consistency of his sausage this year. Like any good Texan I'm not big on sauce, but if that's your thing then John's dipping sauce was tremendous as well (I mostly used it on bread to cleanse the palate after the meat fest). As he usually does he showed that his love for those who appreciate good BBQ is barely masked by that bad boy exterior when he gave a young kid at the front of the line his last t shirt, "Just don't wear that one to school bud.....they won't let ya." It featured his signature motto, "You can all go to hell....I'm going to 6th and Pedernales" (I was jealous of that kid). He also sought us out to offer some expert advice on our itinerary and visit for a minute before commenting, "Well.....I'm bored with you guys now." John's the best... and his Q is a must.....and I'm not even saying that out of fear that he may stab me with a beef rib through the heart on my next visit. Once we finished at John's we got into the truck to head to the next spot when I happened to see a tweet from la barbecue. I quickly hit them back asking if they were open that day (usually they are closed on Tuesdays), and within a minute Ali (who does a terrific job running their twitter) replied they were open for SXSW! We saw an opening to knock out another big spot without even fighting a line. This was our first trip to the new location on E. 6th St., and I must admit we all preferred their previous spot. Parking was a little difficult and the area felt more crowded, but on the upside there was no line! John Lewis is still cranking out some of the best smoked meats in the world. We got our first beef rib of the trip, and it was exceptional. The moist brisket melted in your mouth and the side of chipotle cole slaw was a perfect choice. 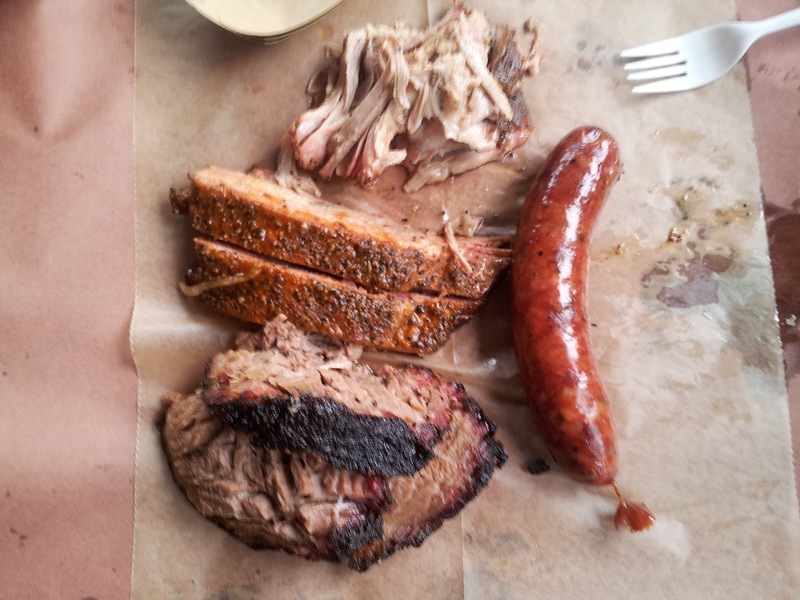 Last year la barbecue was the biggest eye opener for me trying it for the first time, and the change in venue has done nothing to water down the quality of barbecue that is being cranked out at this paradise of Q. La barbecue was the only spot in Austin that we visited still offering free beverages to its patrons. It's a great laid back spot to get some of the finest food in the world! Next we decided to head on over to Stiles Switch BBQ and Brew to spend the rest of the afternoon. We had been in contact with Shane and Lance through twitter (I believe Shane's wife runs the account.....and she does a tremendous job promoting the restaurant) so we were excited about the possibility of meeting the two men behind this Austin landmark. If you don't know, the building where Stiles Switch is located was none other than the Emporium that Matthew McConaughey famously hung out at in Dazed and Confused. The vibe that existed in that legendary film still lingers over this mecca of hangout spots today. If perfect BBQ, large screen televisions, washers on a beautiful patio, local craft beers on tap, and a guaranteed enjoyable atmosphere are your thing......you can't do better than Stiles Switch! It was the perfect spot to sit on the patio a while and throw some washers while our Mueller double header digested. Unfortunately, I lost at washers and had to pay for the Q when we were ready to eat (although I would gladly fork over any amount of cash for the opportunity to partake in some of pit master Lance Kirkpatrick's exceptional food). Don't be fooled by the relaxed atmosphere or the fact they rarely sell out like other spots (by design ....these guys work their tails off to smoke enough meat to ensure their patrons can eat through the evening), YOU WILL NOT EAT BETTER Q THAN STILES SWITCH. We threw down a trinity plate and Lance's succulent beef rib and it was tremendous. We all agreed that the brisket was even better than we remembered last year and the ribs were perfectly rubbed. We would have left happy right then and there, but then Shane Stiles came out to the patio and took us back for a pit tour. We got the opportunity to see Lance at work and talk BBQ with two of the giants in the industry! Getting to hear Lance tell us a bit about his approach to smoking meat and seeing him rubbing down a few briskets was truly a priceless experience. 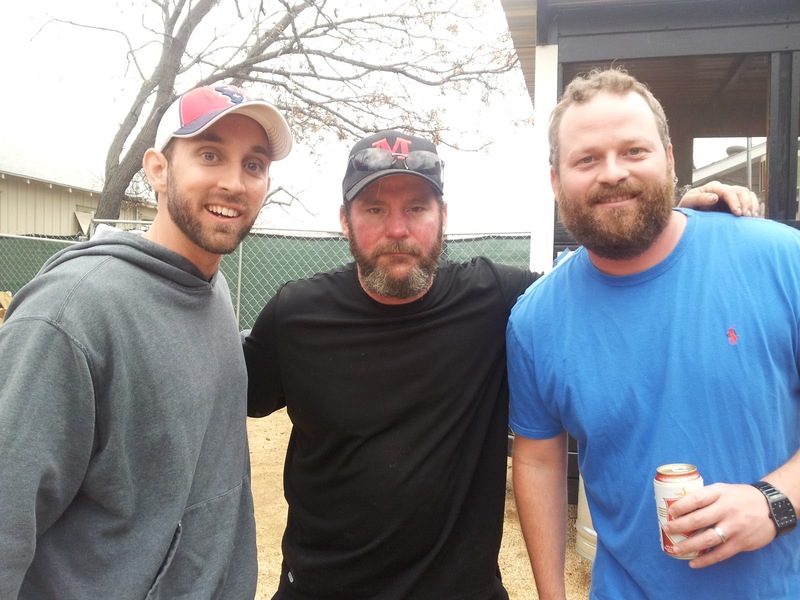 Shane was extremely candid with us about everything from how he got started, his business strategy, thoughts on other Texas BBQ spots, and even football. You can tell that the enthusiasm for good barbecue and mutual respect these two have toward each other really translates into the restaurant as a whole. There's not two more genuine guys in the barbecue business than Shane and Lance, and there isn't a better atmosphere to eat World Class BBQ than Stiles Switch. It was easily the best experience we had on a trip. After a short regroup at the hotel it was time to head out to our first new spot of the year....Freedmen's Bar. Admittedly I was a little skeptical about this so called "fancy" BBQ spot that doubles as a retro-inspired cocktail lounge. There was even a short argument over whether we would partake in a 4th plate of BBQ for the day or just sample some of the fancy sides and desserts, but the honorary Texan in our group demanded, "Guys....we came to eat barbecue!" And eat barbecue we did my friend. We sampled the holy trinity plate with German potatoes, grilled cabbage slaw, and house pickles. Quite frankly this was the revelation of our 2014 trip. Pit master Evan LeRoy is one of Zagat's 30 under 30, and I must say we severely underrated him. 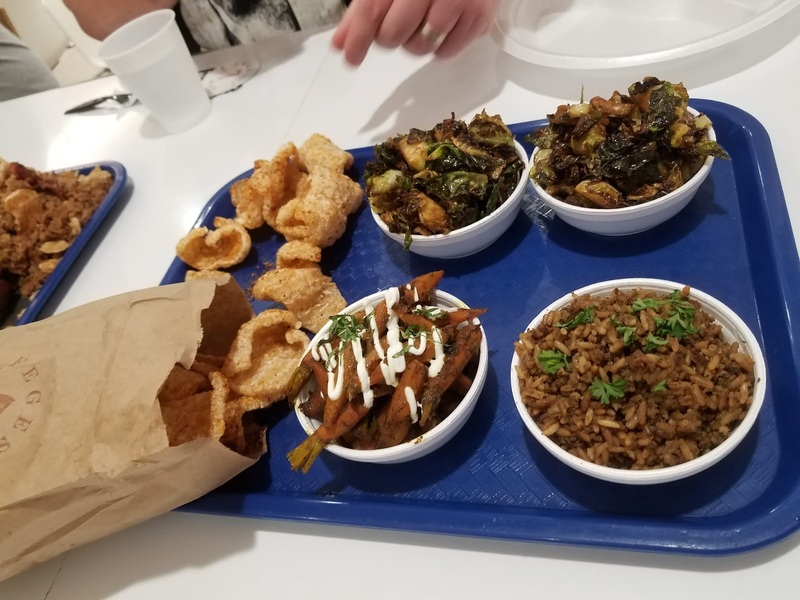 We have never made a better choice than ordering that holy trinity plate. Despite being full of smoked meats, there was not a single morsel of food left on our beautifully laid out tray. I can't recommend Freedmen's Bar enough.....you WILL NOT find a better meal being offered of any type than what Evan is churning out here. We are putting this spot firmly in the annual rotation and I for one can't wait to return for a second meal at this "fancy" Q establishment. It might be fancier than your run of the mill backyard BBQ, but I would challenge any died in the wool BBQ redneck to sample Freedmen's delicious brisket and ribs and claim that they are not authentic enough or worthy of being in the top echelon of barbecue in the world. We all left after some smoked chocolate mousse singing descriptive adjectives for the food experience of Freedmen's. Go there. After a "short" 2 mile hike that has since been affectionately dubbed the "Bataan Death March", we finally stumbled upon Valentina's Tex Mex BBQ. What better way to end a perfect day of smoked meats than topping it off with some brisket tacos. This is the perfect late night snack truck for true Texans! Anybody that knows me knows I love BBQ and Mexican food, so Valentina's is like heaven in a food truck. They've got great barbecue, great tacos, and a friendly staff to meet all your late night food needs. Those tacos were the perfect topper to a great first day, but now it was time to get some shut eye.....Franklin's round 2 would commence early the next morning. What a difference one day and one hour makes. This time we got up early and showed up to Franklin BBQ at 7:20. Only a few people were waiting in their car (it was colder and very windy), so we braved the elements to stake claim to our first ever "first in line at Franklin's" experience. As always we met some great people in line to discuss barbecue, this time some fine folks from Georgia who admitted their barbecue usually existed solely on chopped pork! Boy were they in for an experience. A lot of people bag on Franklin for having such a ridiculously long line, and I admit if I were a native of Austin there are other less crowded spots I would frequent far more often, but everyone should do Franklin BBQ at least once. People wait in line because as Texas Monthly has proclaimed twice now....It's the best. Aaron deserves all the attention he is getting. When he showed up at our table to see how things were.....I have to admit a small part of me knew what teenage girls at a Beiber concert feel like. If anyone is the rock star of Texas Q it's Aaron Franklin....not because he sells out everyday.....because his barbecue will bring grown men to tears. I have never been to Franklin BBQ and left feeling like I had wasted my time waiting in line for food. After dining at the most famous BBQ spot in the world it was off to last year's diamond in the rough Micklethwait Craft Meats. Last year the now famous Mr. "Microwave" (courtesy of Jimmy Kimmel) was hardly a household name, but just like we figured after sampling his meats......he's a reluctant rock star in his own right now. There was a far bigger line this year, but the iconic food truck was still churning out lots of "craft meats" for the fans. We were disappointed when we heard they were out of sausage (widely considered by us the best in town), but when they offered to throw in the last link of kielbasa....we were stoked. It was very easy to see how Tom recently won the Austin Beef Rib Challenge....his offering was roughly the size of my 2 year old son and nearly as tender as the brisket! Tom and his staff are some of the nicest people you can meet and we were all excited to see the much deserved success that Micklethwait (the th is silent) is enjoying. This year we followed up our meat splurge with some of his world famous homemade Moon Pies.....Sweet Mother of all things Holy!!! that was the greatest ending to a BBQ feast I've ever had. I've already promised to try to throw one in an ice chest for my wife next year. 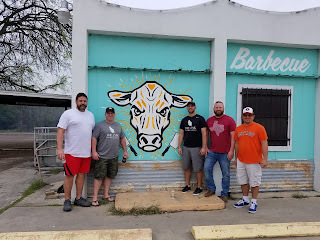 From last year's diamond in the rough we traveled to our last stop and probably best chance at this year's soon to explode spot... Kerlin BBQ. Again we had a small debate on whether we would head back home or try out this new spot we had heard a lot about, and I am glad we made the trip! Get to Kerlin BBQ now before the lines do. They were the only spot we visited with live music, and the bluesy rock was a perfect compliment to their moist brisket, tasty ribs, flavorful sausage, and pickled jalapenos. They have a great outdoor seating area where you can hang out and throw some ladder golf (which we did). The highlight here was a middle aged man who rode up on his bike and asked, "Is this John Mueller's spot?" HAHAHAHAHA....We all had a great laugh thinking about him finding John's spot and asking the man himself that silly question. No sir....this isn't John's spot, but if Kerlin BBQ keeps cranking out the kind of meat we tasted on this day people might just be riding around Austin in the very near future asking,"is this the famous Kerlin BBQ?" One place you never have to wonder if you are at the right spot is Louie Mueller BBQ. Our last stop on the way home was at the iconic granddaddy of them all in Taylor, Texas. If you have never been to Taylor then your BBQ resume is severely lacking my friend. Nothing says Texas BBQ like the historic Louie Mueller building. Last time we came Lance himself was serving the meat and John and LeAnn both learned the ropes here as well. Mueller's is still in the Texas Monthly top 5, and while we feel like there is no place in Texas boasting BBQ quite like Austin anymore.....Louie Mueller and our hometown spot of Killen's BBQ are two of the few joints that can serve the rest of Texas world class cue. It was an excellent last meal of the trip and in a way an opportunity to end where it all started. I'm never more proud to be a Texan than during my annual BBQ pilgrimage and the environment at Louie Mueller's sums that feeling up to a T.
In life we're often faced with forks in the road and #BBQPalooza was no exception. At 8:20 on a Tuesday morning we wisely chose to leave the line at Franklin's and go off the plan for our annual trip. Dangerous? Possibly. Daring? Maybe. Genius? Absolutely.....and much like LeBron quickly turned his doubters into fans, our decision led us down a path of World Championship BBQ that we will never forget. Easily one of our best trips due to chance, experience, and more than a little luck.....#BBQPalooza will be remembered as an epic trip of smoked meat goodness. Hope you had as much fun reading about it as we did living it.....now go get some Q! ﻿ Sometimes things just seem to come together: peanut butter and chocolate, the Showtime Lakers, the cast of Shawshank Redemption......the 2013 version of our annual BBQ tour. This year marked our third annual trek into Central Texas to partake in copious amounts of God's gift to men (besides woman of course) ...BBQ. This year's tour began with a downer, but the news that one member would have to come late, like nearly everything else that happened this year soon became a huge positive (more on that later). Even the rainy weather we saw in Austin over the weekend was as if God was shedding tears of joy and blessing over our ambitious journey (no way we would have been able to hit all these world class joints if the weather hadn't chased some less than diehards away!) This year's bbqpalooza was marked by fortune at every turn, and the best hospitality we have ever received on our treks into BBQ holy land. Without further adieu.......here's what transpired. We arrived in Austin on Friday evening and our one stop was to be a relatively new spot recommended by @TXCleaver called Micklethwait Craft Meats. A trailer specializing in BBQ and relatively unknown (NOT FOR LONG!) to many... even in Austin as we would find out throughout the weekend. This was an awesome start! 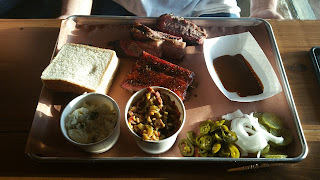 Every other BBQ joint we have hit previously were pretty well established and well known, but here we all got the feeling that we were getting in on the ground floor of something special. Owner/Pit Master Tom Micklethwait was an extremely cool guy, recommending the homemade greens as a side, telling us how he converted a water heater from an old school into his smoker, and even throwing in a pork shoulder (which turned out to be delicious!) into our to go order. His handmade sausages (we had an andouille and veal sample) are some of the tastiest I've ever eaten. We all agreed we would have rather the sausage not cut so small (as we enjoy being able to bite into the snap casing), however that's not to take anything away from a sausage that was bursting with tremendous flavor and texture. The moist brisket had obviously been smoked with the care only few people living in Central Texas have perfected, and the ribs got thumbs up all around. The greens we ordered featured rutabaga and sausage, and I'm not throwing out hyperbole by saying they were the best greens I've ever tasted. Getting back to the hotel that night and discovering the pork shoulder was the icing on the cake. 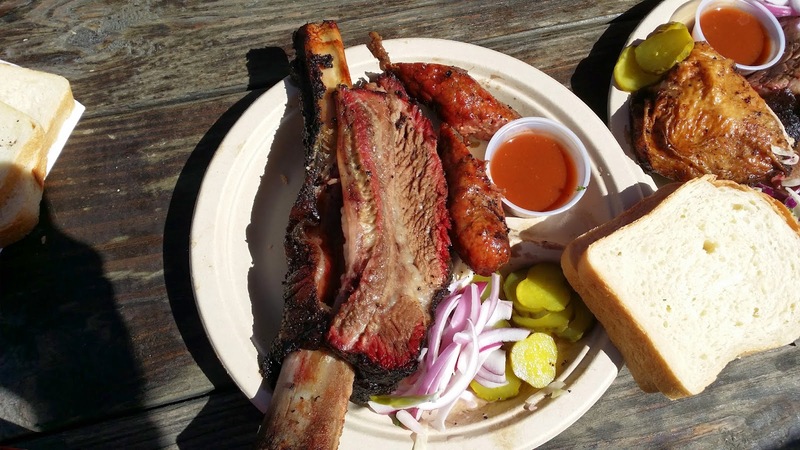 Get to Micklethwait's Craft Meats before it becomes another sacred BBQ joint where waiting in line is part of the process! We needed all the rest we could get before the gorging on Saturday so we headed out to the East side for a short night full of hipsters, food trucks, and eclectic dives only Austin could supply before calling it an early night. Line outside Franklin BBQ at 9:45 a.m.
We woke up bright and early Saturday because, well.....it takes dedication to sample 7 BBQ joints in one day. We knew we would need to be at the front of the line at Franklin's to accomplish our lofty goals for the day. So at 8:20 we were excited to see that we would be tenth in line at Aaron's temple to all things meat. As previously mentioned, our buddy Rashad was having to meet us Saturday morning. A giant letdown at first, until he came up with an idea that will go down in BBQ lore alongside indirect heat. See, truth be told when our buddy Chris released the 2013 itinerary we were all a little disappointed. Due to time constraints and its limited hours, Snow's BBQ in Lexington would be left off the list for the first time in three years. You have to understand.....Snow's brisket (in my humble opinion) is the single greatest piece of meat in Texas (thereby also the World). It is a mecca to moist, fatty, meat goodness that demands to be tasted by all true connoisseurs of BBQ. Never fear: Rashad left extra early, was first in line at Snow's, and showed up in front of all those hungry Franklin's patrons with a foil wrapper filled with the only breakfast worthy of BBQpalooza......Snow's brisket! Needless to say we became the most popular men in line, and a few kind folks who had previously extended some Texas BBQ hospitality our way during the long wait were rewarded with a slice of their very own Snow's brisket. It was finally 11:00 and time to head into Franklin BBQ. Aaron Franklin is the closest thing the BBQ world has to Elvis. People wait hours to eat his BBQ daily, he's been on the cover of Texas Monthly, and his YouTube channel has given our pal Chris the biggest man crush since Howard Cosell met Ali. Unfortunately, Aaron was busy out back preparing to not only feed the hundreds lined up at his restaurant, but also cater a huge SXSW event (the perils of BBQ royalty...). We sat down slightly disappointed, however before we could dig in Benjy (Franklin's right hand man) approached us and proceeded to take pics, give us the rundown on the weekend, and share our love for BBQ. It takes more than a single man to meet the high standards of BBQ lovers each and every day, and I'm sure Aaron knows this already, but Benjy is a great representative of the restaurant and a preview of how our day would go. As for the meat.....well friends....people don't stand in line for hours to partake in inferior BBQ. For the second straight year Franklin BBQ received the highest overall score from our group. The brisket is quite possibly only second to Snow's, the pulled pork was fantastic, the sausage had a perfect snap, and OH DEAR that pork rib! I had a strong inclination that it was the best rib I had ever eaten. 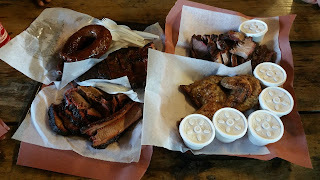 Before the clock had hit high noon, we had already consumed Snow's brisket and an entire plate of Franklin BBQ. When we left John Mueller Meat Co. we headed over to his former place of employment, and sister's current spot ...la barbecue. We had to fight some terrible SXSW traffic, and it started to rain hard when we got there. The seats were wet, water was dripping on me, and I just didn't really have the same anticipation as I had for other spots. My mistake. 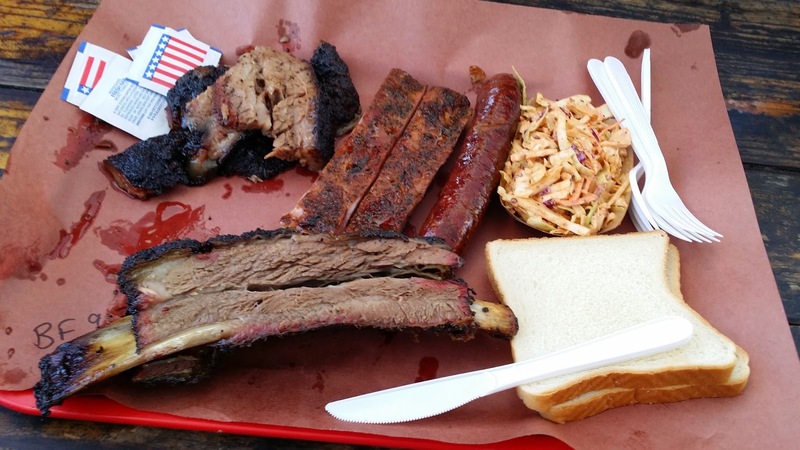 La barbecue deserves the same treatment as all the other world class spots we hit in Austin. The new pit master supposedly came from Franklin, and the melding of Franklin/Mueller delivered some of our best overall scores (despite the terrible weather conditions). 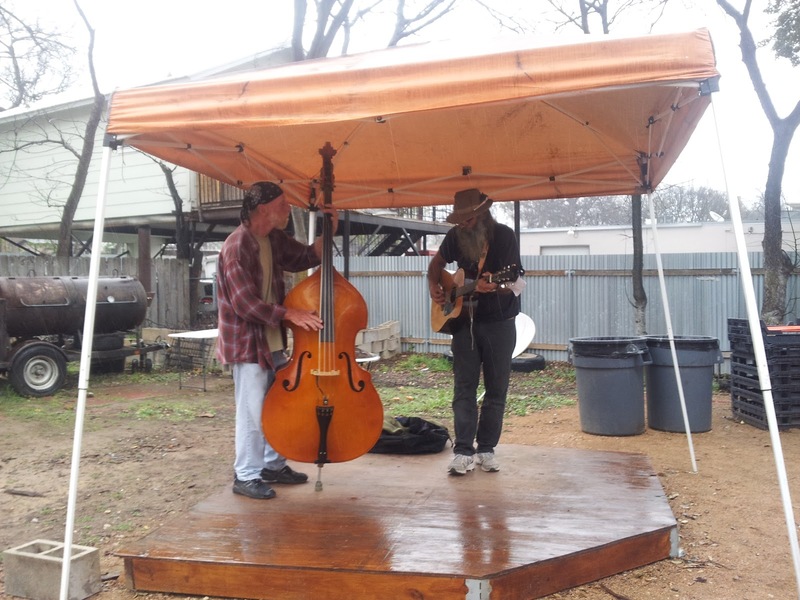 As if not to be outdone by brother, la barbecue had its own free ice chest full of Lone Star, gave out brisket to those in line, and even had two old guys playing bass and an acoustic guitar belting out some tunes that sounded straight out of O Brother, Where Art Thou. This was easily my best surprise of the weekend. If the siblings want to break off and make two temples to meat instead of one?.....well...all the better for us my friend. Louie Mueller BBQ in Taylor is great, but for my money what the siblings lack in historical sites they more than make up for with superior meats now. The brisket was top 3, the pulled pork was excellent, and even the chipotle coleslaw was the perfect palate cleanser. I cannot recommend this spot to you highly enough.....go there! The last stop in Austin was to be Stiles Switch BBQ. I'll admit, at this point I was full and ready to start heading back through Lockhart. With all the Twitter chatter I was getting, my fatigue and busy timeline made me forget that Stiles Switch had wanted us to say hello when we got there and probably had been the most welcoming pre-meal place! I made a restroom break and allowed another member to place our order. He returned with an incredible plate of meat (as you can see above)....LOOK at that Beef Rib....it was amazing! 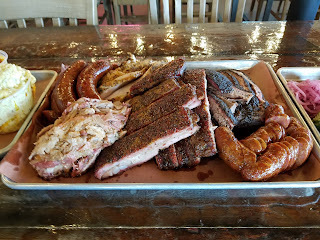 The pork rib and sausage were right on par with the rest of the perfectly smoked meats at the other Austin spots.....but something was wrong. The brisket was rather dry and not up to the standards of what we'd been eating. Apparently, my friend did not request the moist cut (party foul), and I didn't follow through on my promise to say hello. In swooped pit master Lance. He could have been offended that we forgot to say hello and didn't even finish our brisket (honestly I probably would have), but just as I was remembering my promise Lance approached our table with grace, mercy, and a generous amount of moist brisket. "Hey, I'm Lance. I noticed you guys didn't get the moist cut. We've been making more meat than usual this weekend and must have slipped a drier piece in there. Try this out guys." Unbelievable! In a day filled with tremendous hospitality, it was Lance at Stiles Switch who truly took it to the next level. 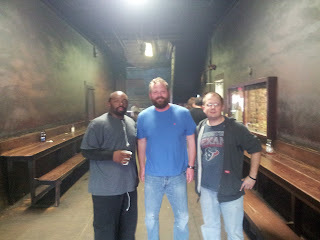 He stayed and talked for a bit while we assured him that his brisket was some of the best in the world. Extremely moist, excellent fat rendering, and super bark. Take this as my formal apology sir, I assure you that next time I'm in Austin I'm going to head to Stiles Switch one evening to eat that glorious BBQ on an empty stomach, throw washers on the enclosed porch, and hang out for a couple of hours at this meat temple.